Passengers who have struggled through the timetable crisis will be amazed that there can be any talk about a fares increase in England! Yes, some special compensation has been offered to some of those affected by recent disruption (but this does not help those who simply could not travel, as was the case in some places). Yes, we do need continued investment to help build a better more reliable railway, but the recent crisis has been unprecedented. A fares freeze would benefit all passengers – not just those eligible for compensation, help kick start the process of re-building trust, and begin to bring passengers back to a railway they can rely on. It is also time that a fairer, clearer formula based on the Consumer Prices Index is used to calculate annual fare increases – rather than the discredited Retail Price Index. Transport Focus has long argued for this change, so we welcome comments made today by Chris Grayling that support this shift. Sure, you would have similar actual fare increases, but at least the formula used would be more transparent and honest. More specifically, it would show just how much fares are really rising and how much costs in the rail industry also keep spiralling. Fare rises also underscore the need for all passengers to have easy access to the best value for money fares for their journeys. We know from our research that many rail passengers want a smarter ticketing system – one that they can understand and trust, is simpler to use, better value for money and offers choices that suit the way we travel now. We encourage passengers to have their say about future ticketing in the joint Transport Focus and Rail Delivery Group ‘Easier Fares’ consultation before it closes on 10 September. Please speak up! Action on rail fares has now become imperative. The cumulative effect of above inflation fare rises year after year has pushed some fares and passengers to the limit. 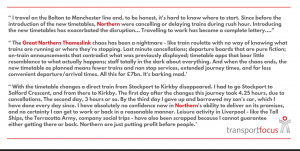 With Churchill’s metaphor in mind, the lemon pips are now squeaking – not much more can be wrung out of regulated fares, and news about all those unregulated fares that the trains companies set is still to come.